About this Blog – Caitlin Frances Bruce, PhD. * What is public art’s social function in times of social crisis? * Who is the “public” that such art communicates with? * How is a sense of collective, local, national, or transnational identity forged through muralism and graffiti? * How does the legacy of Rivera’s scandal continue to haunt the form, content, and dialogues surrounding public art? * What is the relationship or non relationship between muralism and graffiti, and what does it tell us about how both art forms are means of collective communication or protest? In order to answer these questions I have a few research clusters. First, I want to tackle the “afterlife” of the Rivera controversy by learning about the mural’s (“Man at a Crossroads”) role for Mexican muralism today. I will interview muralists in Mexico City about their perspectives on their work, relationship to Rivera, and thoughts about the above issues. 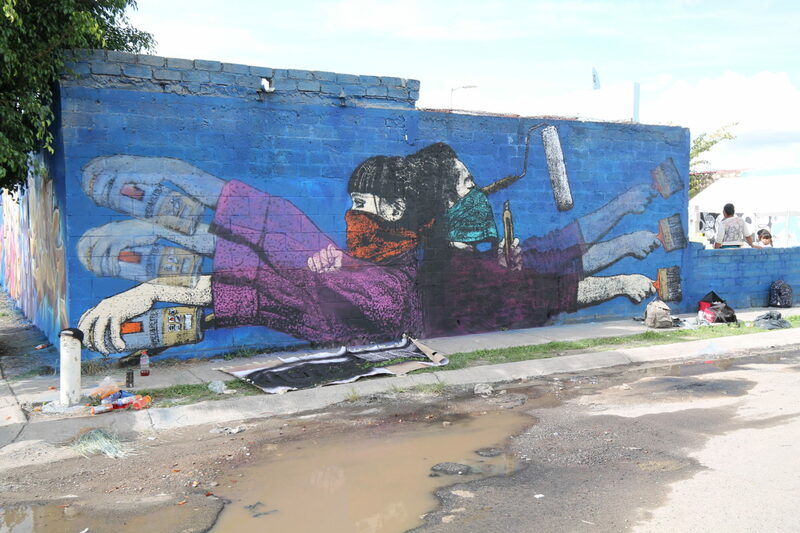 Second I look at graffiti as another “heir” to Revolutionary muralism, and will study the Meeting of Styles, a global graffiti event, in Chicago and Mexico City, as a way to investigate how graffiti functions as a form of public communication that might provide a kind of global solidarity. This is also largely interview based. Third, I will learn about how muralists in Chicago use their art socially. Artists from Chicago Public Art Group and Yollocalli have agreed to speak to me about their various projects. Fourth, I will look at a couple of mural projects in Philadelphia, a place where public art has an incredibly respected and institutionally supported role, in contrast perhaps to the situation that faces graffiti in general, muralism in many cities, and Rivera’s work in the United States during the 1930s. Finally, I will reflect on the threat to 5pointz in New York, as a way to reflect on how the scandalous and ephemeral nature of public art continues. I hope to speak with MERES about this issue. I am an academic, so these clusters will be informed by some theory, some history, and some of my own readings of secondary texts. I am using this blog as the public side to this research, and hopefully a way to create a broader conversation (art world and beyond) about issues of public art, public space, and urban community. I will post the majority of my interviews. I have not yet figured out how polished the transcripts will be (they are at the moment pretty raw) and how much to mess with the “original” recording to make them more grammatically proper (zero percent of the population myself included uses perfect sentence structure for spoken word), or whether I want to, because part of what I want to do is portray some of the texture and sense of the art scenes I encounter. Any suggestions or criticisms or comments on this issue are appreciated. I know I may have spelled some writers names wrong, and that I may have misheard some things. I come at this with the greatest respect. I started this research more or less six years ago in undergrad, in Chicago, and hope to finish most of it by the Spring of 2012, somewhere in the vicinity of Pittsburgh, New York, Chicago, Philadelphia or Mexico City. I am extremely grateful to the artists, scholars, fellow art lovers and friends who put up with my ignorance, single-mindedness, and sometimes verbal flat-footedness. Bespectacled, notebooked and slightly deaf in my left ear, making them repeat themselves more than once and clarify things that seem obvious, I appreciate their willingness to share stories, answer questions they must have heard many times, and reflect on their work for an outsider. The generosity of the interlocutors who make up this project provide the motive for this project, and the energy for it. Thank you so much.